Gym anxiety is common when you first start working out somewhere new. If you're a student, you might also be afraid of gym class at school. On the other hand, for those with social anxiety disorder (SAD), fear about going to the gym or attending gym class can be so severe that it interferes with just getting through the day. Imagine the thought of an upcoming gym session or phys ed class leaving you so distraught that your stomach is in knots or you experience a panic attack. That is the experience of many people with SAD when it comes to working out in public or going to gym class. 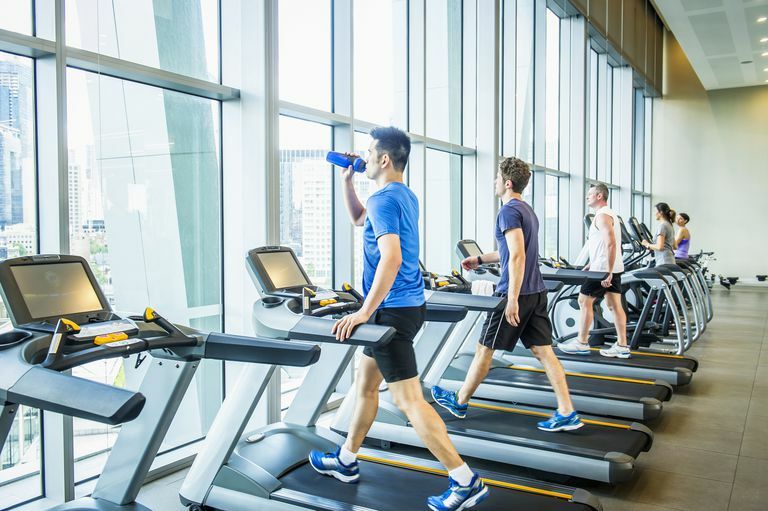 Methods of coping with social anxiety at the gym fall into five broad categories: managing negative thoughts, building confidence, gradual exposure, getting help, and choosing alternatives. Therapy for social anxiety disorder involves managing the negative thought processes that keep your anxiety going. Use this method to help cope in the following ways. If you think, "Everyone is staring at me. They must think I'm fat and out of shape," replace it with the more realistic thought, "Everyone is focused on themselves and their own workout. I don't think they care much what I am doing or what I look like." If you think, "I feel so anxious, I can't get through this workout," replace it with the more realistic thought, "I need to focus and I can get through this. Keep counting the reps (check the distance or time) and do my best." If you think, "What am I doing here? I don't belong here, I can't do this," replace it with the more realistic thought, "I made a goal to get in better shape. I am working toward that goal. I belong here just as much as everyone else." Keep going. The more often you go to the gym, the easier it will get each time. Research the gym equipment ahead of time so you feel less intimidated and are familiar with the purpose of each one. Or, go with a friend who already knows how to use it. Realize that as you become more fit, your confidence will grow as well. Buy gym clothes that make you feel confident, that you like wearing, and that make exercise easier to do. When you are first getting used to a new gym, be kind to yourself. Gradually expose yourself to new situations so that anxiety can subside and eventually your confidence will grow. Consider going at off-peak times at first, to avoid big crowds. Wear headphones and listen to music or audiobooks at first, to help manage your anxiety. Make a hierarchy of things to accomplish from small to big, and remove all expectations beyond the current stage you are at on this list. A simple example of your visits to the gym might look like this. Your list might look different depending on what you find the most anxiety-provoking things to do. Work out at home doing something you enjoy. Go to the gym and walk around a bit. Exercise on one machine for 10 minutes and then leave. Make a list of exercises using machines and complete everything on your list. Say hi or make small talk with one other member of the gym. Take a group class such as Zumba or yoga. If you are still struggling to find your place, go to the gym with someone who already knows his or her way around, or sign up for sessions with a personal trainer to get a proper orientation. If you find that working out at the gym just doesn't suit you, think of other activities that you can do such as working out at home, walking/running, or swimming. Anxiety at the gym is not limited to adults. Many children and teenagers also suffer severe social anxiety at the thought of taking part in physical education class. You and your parents should work with the school on this problem. If you've been diagnosed with SAD, have your parent arrange a meeting with the phys ed teacher, guidance counselor, principal, and/or school psychologist. In this meeting, you can talk about alternatives such as one-on-one exercise programs or credit for exercise done in your home or at places outside the school. As a parent, you can help by practicing sports with your child that you know he or she will be doing soon in phys ed class. Also, talk to your teen about how it is okay to laugh at yourself, and that trying is more important than being the best at a sport. Help your child/teen find physical activities that he/she truly enjoys to build confidence and a love of exercise. With all the anxiety it causes, you may wonder if the gym or phys ed class is even worth it. A 2014 systematic review showed that exercise (both aerobic and non-aerobic) was effective as an adjunctive treatment for anxiety disorders but less effective than antidepressant treatment. Added benefits were shown for people with SAD who combined exercise with group cognitive-behavioral therapy. However, a 2013 meta-analysis could not find support for the use of aerobic exercise as an effective treatment for anxiety disorders compared to control conditions. It seems that exercise may be best used in addition to regular treatment for social anxiety disorder. It's not a replacement for therapy or medication, but when added to these traditional treatments there may be some added benefit. Have you been diagnosed and received treatment for social anxiety disorder? If not, and if your symptoms of social anxiety are severe, make an appointment with your doctor for further assessment and treatment. If you (or your child/teen) is diagnosed with SAD, you will have access to treatment options and may be better able to understand your limitations when it comes to the gym or phys ed class. That is not to say that you can't participate, but that it might take you a lot longer to feel comfortable. If this step seems too difficult, you could also start by reading self-help books on the topic to learn more about different therapies that are available, and eventually build your way up to receiving outside help. Bartley CA, Hay M, Bloch MH. Meta-analysis: aerobic exercise for the treatment of anxiety disorders. Prog Neuropsychopharmacol Biol Psychiatry. 2013;45:34-39. Jayakody K, Gunadasa S, Hosker C. Exercise for anxiety disorders: systematic review. Br J Sports Med. 2014;48(3):187-196. Portman RM, Bradbury J, Lewis K. Social physique anxiety and physical activity behaviour of male and female exercisers. Eur J Sport Sci. 2018 Mar;18(2):257–65. Cook B, Karr TM, Zunker C, Mitchell JE, Thompson R, Sherman R, et al. The influence of exercise identity and social physique anxiety on exercise dependence. J Behav Addict. 2015 Sep;4(3):195–9.